Man of La Mancha acted and sung with all the passion it can arouse, is revived by the Compass Rose Theater in Annapolis, Maryland. It is a treat. While its score may be Broadway- lite, a reminder that there is hope for humans who dream is welcome. The role of the Knight who fights windmills is complex. 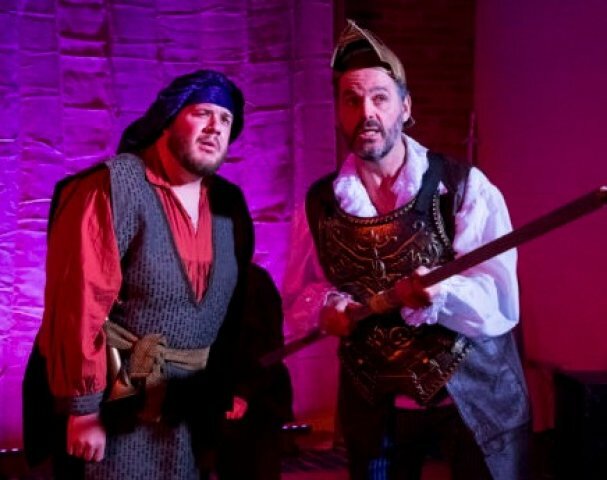 The singing actor playing both Miguel de Cervantes and Don Quixote must capture both the personality of the mad Knight who is a figment of the literary imagination of Miguel de Cervantes and Cervantes himself who tells the story as we see it simultaneously enacted. As Cervantes Patrick Gerard Lynch gives us a real human being,who purchased goods for the Spanish Armada and was a tax collector. Dale Wasserman (author of the underlying story and also the story of the musical) has written the principal role as a two-hander played by one singing actor. Lynch miraculously draws a human figure, scribbling away in a dungeon, and the character of Alonso Quijana, a dreamer who imagines himself a Knight errant wandering the world with his sidekick, Sancho Panzo, pursuing impossible dreams. As Cervantes, Lynch speaks in the conversational voice of an author telling a story. In contrast the Man of La Mancha summons up the elegant diction he clearly imagines for himself. Negotiating the Scylla and Charybdis of this dual role takes an actor of consummate talent. Lynch has it. Superb acting is the least of Lynch’s talents. He is a great singer, his tenor having been deployed from pop to Gilbert and Sullivan to Richard Wagner. Here he brings a steely edge to the lower range of the Knight’s singing role. It is thrilling to hear him belt out songs which include the iconic "To Dream the Impossible Dream". The supporting cast from New York and Washington, D.C. is wonderful throughout. Michael Ferlita as the priest sings beautifully. Aldonza/Dulcinea played by Elizabeth Hester and Innkeeper Joe Hanson add a special dimension to the performance. Elyssa Bosco, the Innkepper’s wife Maria, and Claire Gallagher as Antonia mix a big presence with subtle gestures. Rebecca Dreyfuss as the housekeeper enchants. Lucina Merry-Browne directs. On the small stage, the dungeon in which Cervantes awaits his trial by the Grand Inquisitor is cramped and foreboding. (Factoid: Cervantes spent five years in prison after he was captured by Barbary Pirates. He never faced the Inquisitor.) The actors move to indicate this restriction of space. Yet when the Don dreams, Lynch opens the space by graceful movements which suggest a free and appetizing world of opportunity, even when enemies like the windmill threaten. Lynch seems relaxed as the author and stands taller and taller as the Don. Marianne Meadows designed lighting to provided richly colored textural background to scenes. Black blocks of various sizes indicate the dungeon and set the ongoing action effectively. Sangah Purinton played piano accompaniment with verve. This revival suggests that Man of La Mancha should be mounted often for audience pleasure and to encourage hope.